By nature all large breed puppies are evolved as carnivores, which means they are thrive on a varied diet rich in fresh meats with smaller amounts of fruits, vegetables and grasses. With high ratios of free-run chicken and turkey, whole eggs and wild-caught fish, all farmed or fish and delivered fresh each day, Orijen Puppy Large Breed is brimming with the proteins and fats that replicate the same rich and diverse balance of fresh meats that young dog and nourish them completely. Carbohydrate-limited and grain free to mirror the natural diet. Orijen Puppy Large Breed bridges the gap between good nutrition and peak health with regional fruits, vegetables and botanicals, including licorice root, marigold flowers and sweet fennel which are rich in B-vitamins, phytonutrients and essential trace minerals. Formulated for large breed puppies, this unique formula is made with low-ash chicken and fish ingredients that keep calcium and phosphorus at healthy levels which is a common concern in large breed puppy diets. High-protein, low carbohydrate and grain free. Orijen features fresh regional poultry, eggs, meats and fish and a Biologically Appropriate ratio of up to 80% meat, 20% fruits and vegetables and zero grain. 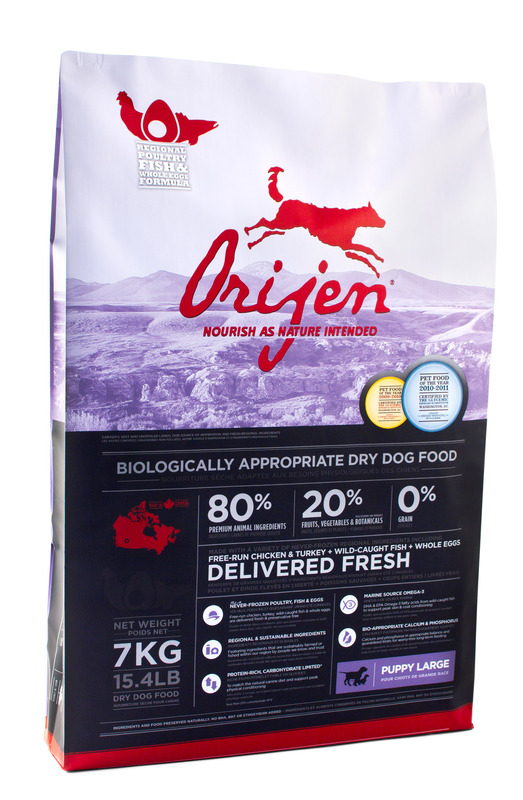 NO DRY PUPPY FOOD ON EARTH MATCHES THE QUALITY AND QUANTITY OF ORIJEN'S FRESH MEAT INGREDIENTS. Orijen large puppy dog food is a fantastic quality food. I have a 8 month old Chocolate Labador Receiver and she looks fantastic. I think you pay for what you get. The dried food you buy in supermarkets and which are highly marketed you need to look at the ingredients - I did but it was too late - pet food analysis. I fed my last dog a boxer on Supermarket dried food - I think looking back that it destroyed her, not enough protein - protein derivatives, loads of E numbers and maize. This well know brand used to run through her. It is sold in every supermarket in Ireland. I know boxer don't live a long life but she had to be put down during Easter, she was 5. My gut feeling is that the food had not enough protein to sustain her system. The vet asked what I was feeding her and I could read his reackon. I was heart broken. Once I feed my lab twice a day and do not give anything between she is great. The ingredients alone are fantastic. People stop me all the time and comments on how fantastic she looks including the vet. I showed my vet a copy of the ingredients and he read it all - he was very impressed - I asked should I add some rice etc and he said NO she has everything she needs. This is the best food I have ever used, my dog is a King Charles Spaniel and they are very sensitive when it comes to the type of food they can eat, but this is the best dog food around. It is a little more expensive but when you see a healthy dog with a shiney coat you understand why. I started on the puppy and promoted him to adult without upset tummies or runs.